It’s the key to how effective we are. Understanding our own cycle of energy, knowing when we’re at our energetic best and spending that prime energy time on what we most want to accomplish are keys to living the life we want to live. Eat for Energy - what amps our energy and what drains it? I’m opting for more fiber. I like the idea of opting for more food rather than focusing on what I should eat less of. Move more - I’ve set alerts for Dance Time accompanied by high energy music. Meditation - Sebastian Michaels uses what he calls “gateway meditation” … deep listening to a piece of classical music. Habit Tracking app - “Way of Life” free version allows you to track three habits. I’ve been doing this on index cards for a few weeks so I immediately paid $4.99 for the premium version and am tracking 5 habits. 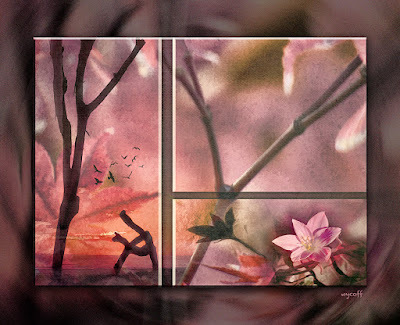 Photo Artistry Challenge #6 focused on creating a triptych of landscape items. This challenged me from the beginning. I couldn’t find a division of the canvas that pleased me, base photos that I chose didn’t play well together, and I didn’t like the suggested texture overlays. I must have created and deleted twenty or more layers before the image above felt finished. When I finally got the title for the piece, I thought I should call it "Coming Together ... Finally!" These challenges are really important to our learning processes and probably the more frustrating they are, the more we’re learning. Or, at least that’s what I keep telling myself. This post was prompted by Sebastian Michael's "21 Days to Creative Living" and "Photo Artistry" programs. More information here.